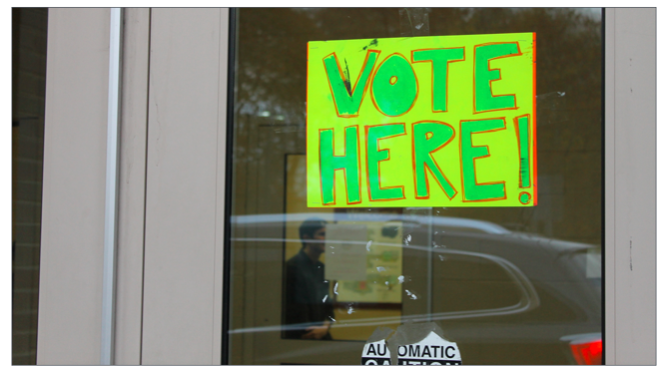 LANSING (FEB. 8, 2019) — Michigan’s top 150 political action committees (PACs) combined to raise $97 million over 2017 and 2018, shattering their past fundraising record for a two-year election cycle. The total is up 42 percent from the previous record, which was set the last time Michigan elected a governor. For 2013 and 2014, the top 150 PACs combined to raise $68 million. Before then, the record was only $51 million for 2005 and 2006. The upward trend points to the growing role of groups acting independently of candidates in campaigns and the increased financial influence of individual families and organizations. Some of the largest PACs got their funding from one family or one entity. The Great Lakes Education Project, which promoted Republican candidates for the Legislature, was the 58th largest PAC and received almost all of its dollars from members of West Michigan's DeVos family. A super PAC called Powering The Economy ranked 66th and received most of its money from the Detroit Regional Chamber of Commerce. A surge in activity from super PACs, like Powering the Economy, and increased dollars flowing to PACs connected to state lawmakers helped balloon the 2017-2018 fundraising total. Super PACs can accept unlimited contributions directly from corporations and labor unions, but they spend their dollars independently of the candidates they support. That means the super PACs buy ads endorsing a candidate instead of giving the money to the candidate’s campaign. For the 2010 election, only two super PACs were among the top 150 PACs. For the 2014 election, 32 super PACs were among the top 150 PACs. For 2018, 39 super PACs were among the top 150 PACs. While state law limits what candidates can raise from individual donors for their own campaigns, lawmakers’ PACs, known as leadership PACs, can raise unlimited amounts of money from individuals and PACs. Lawmakers use the leadership PACs to support their colleagues and to boost their political parties's chances. The 2018 election saw leadership PACs collect more money than ever before. 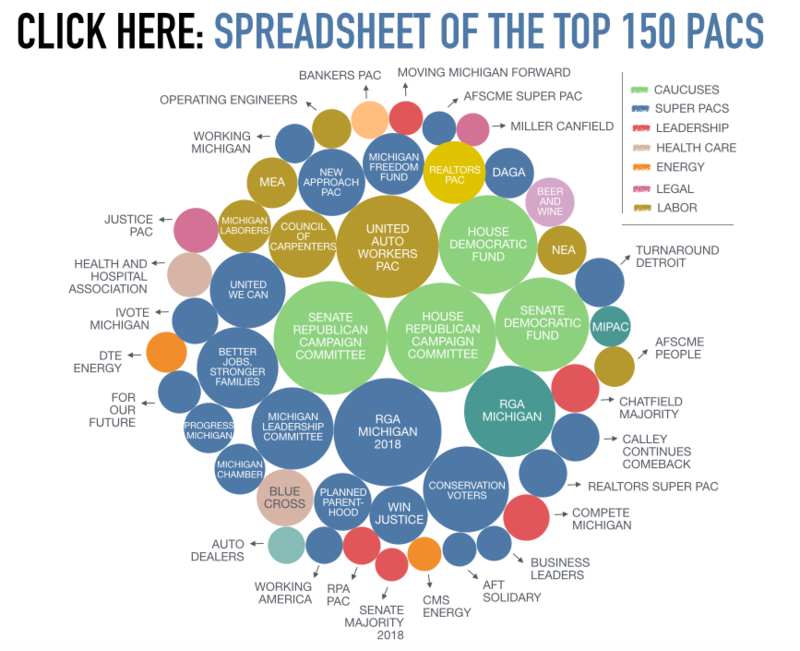 But most of the PACs among the top 150 were connected to interest groups that advocate for specific policies in Lansing that benefit their supporters. Other PACs are connected to national groups that want to boost their party’s electoral chances. Generally, PACs raise money to give to candidates or to try to influence elections through direct spending on ads or campaign efforts. If PACs are raising more dollars, it’s an indication that the overall cost of the election will be higher. That seems to be the case with Michigan’s 2018 election. While the final disclosures haven’t been tallied yet, the 2018 election already appears to be the most expensive state election in history. To see a breakdown of the top 150 PACs in Michigan for 2017 and 2018, click here. 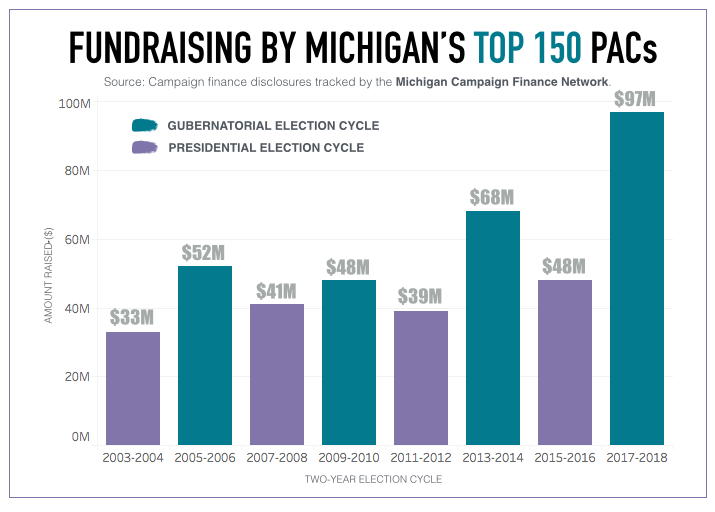 Michigan’s 2018 election saw super PACs play a larger role than ever before, and more super PACs made the top 150 PAC list. For 2017 and 2018, the 39 super PACs that were among the top 150 PACs raised a combined $35.9 million. For 2013 and 2014, 32 super PACs made the list of the top 150 PACs. They combined to raise just $22.1 million. In the 2018 primary races for governor, there were candidate-focused super PACs advocating for individual candidates for the first time. Better Jobs, Stronger Families raised $2.7 million backing Republican Bill Schuette, who won the GOP nomination. Another super PAC, Calley Continues Comeback, backed Republican Brian Calley and raised $965,225. After the primary election, super PACs continued to play a large role. The most active super PAC overall was RGA Michigan 2018, which is tied to the Republican Governors Association, a national group, and supported Schuette. It collected $4.7 million, according to disclosures. On the Democratic side, the Conservation Voters of Michigan raised $3.4 million, and United We Can Michigan raised $2.3 million. Both backed Democrat Gretchen Whitmer for governor. In the race for attorney general, a super PAC called Michigan Freedom Fund raised $1.5 million and backed Republican Tom Leonard. The super PAC was tied to the Republican Attorneys General Association. The Democratic Attorneys General Association MI People Lawyer Project backed Democrat Dana Nessel and raised $1.0 million. The only committees on the top 150 PAC list that face limits on how much money they can raise from individual donors are four caucus committees. These committees raise money on behalf of the House Democrats, House Republicans, Senate Democrats and Senate Republicans. They invest the dollars in the most competitive legislative races as they battle for control. A donor can give up to $40,000 per year to a caucus committee. Over 2017 and 2018, the four caucus committees combined to collect $17.7 million, including loans they took out before the November election. For 2013 and 2014, the four caucus committees combined to raise only $11.0 million. One of the reasons the caucus committees have been able to raise more money is because lawmakers voted to double campaign contributions limits in December 2013. That legislation allowed donors to give $40,000 per year to caucus committees instead of just $20,000 per year. The Senate Republican Campaign Committee raised the most money for 2017 and 2018 at $5.2 million. The House Republican Campaign Committee was second at $4.8 million. The Senate Republicans and House Republicans both won majorities in the 2018 election. The Senate Democratic Fund raised $3.6 million, and the House Democratic Fund raised $3.9 million. The top 10 leadership PACs, PACs connected to public officeholders, raised 80 percent more money for the 2018 election that they did for the 2014 election. 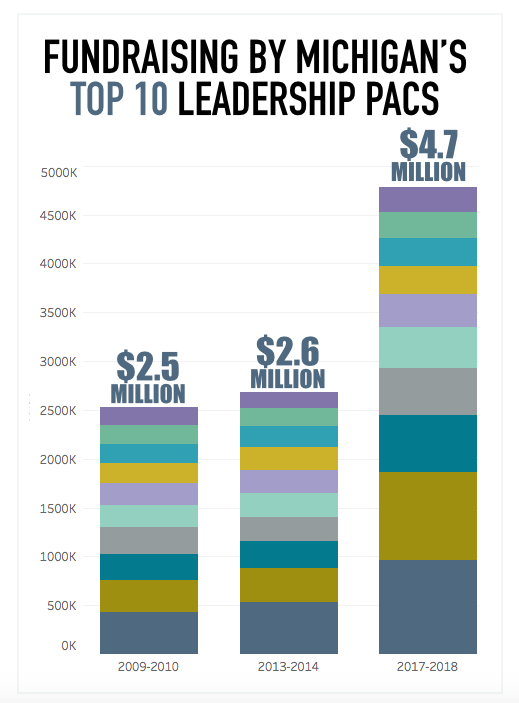 The 10 largest leadership PACs combined to raise $2.6 million over 2013 and 2014. Over 2017 and 2018, they raised $4.7 million. The top individual leadership PAC for 2017 and 2018 raised $965,225. That PAC was House Speaker Lee Chatfield’s Chatfield Majority Fund. Its top donor was the Republican State Leadership Committee, which gave $180,000. Chatfield, a Republican from Levering who became House speaker at the beginning of this year, had a second active PAC as well. The Chatfield Majority Fund 2 raised $421,630. The PAC of new Senate Majority Leader Mike Shirkey, a Republican from Clarklake, was the second largest leadership PAC and was 30th overall on the top PAC list. Compete Michigan raised $895,966. Gov. Rick Snyder’s Relentless Positive Action PAC was the third largest leadership PAC, raising $568,388. Roger Penske, chairman of the Penske Corporation, gave $250,000. The most active leadership PAC connected to a Democrat was Detroit Mayor Mike Duggan’s Duggan Leadership Fund. It raised $288,582. Then came The Elder Fund For Michigan of Rep. Brian Elder of Bay City. His PAC raised $267,525, with $200,000 coming from the United Auto Workers’ PAC.